Facing a media storm over his private life, French President Francois Hollande unveiled a program of tax and spending cuts Tuesday in a bid to revive confidence in his country's stagnant economy. The eurozone's second biggest economy barely grew in 2013, acting as a drag on the region's wider recovery from its longest recession on record. French unemployment, at just under 11%, is higher than a year ago. "The time has come to settle the most important problem facing France," he told reporters. "We need to produce more, we need to produce better." It was Hollande's first appearance before journalists since a French tabloid newspaper reported allegations that he was having an affair with a French actress. "These are painful moments, but I have one principle -- private affairs are dealt with in private," he said. France's performance has fallen far behind that of Germany, and some weaker eurozone states, leading some analysts to label the country the "sick man of Europe". Elected in 2012 on a promise to put job creation before austerity, the Socialist president has been tinkering with reforms for over a year. But his early preference for raising taxes rather than cutting spending to bring government borrowing under control dismayed entrepreneurs, and modest labor market reforms have failed to persuade companies to invest. 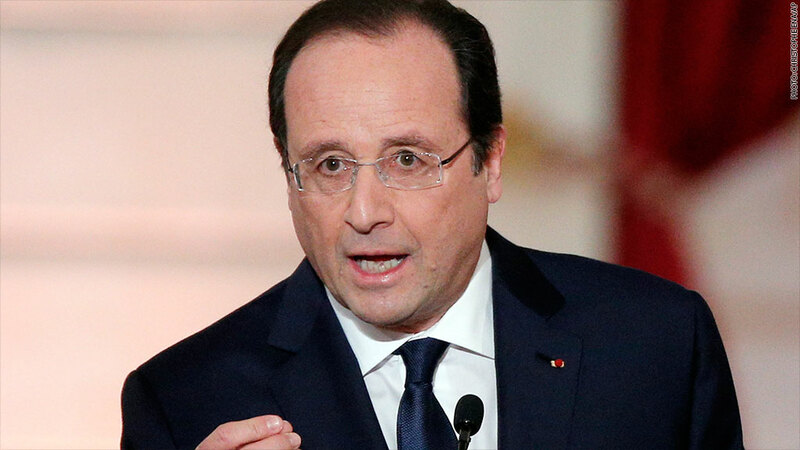 Hollande has been urged by his European partners and international institutions to be bolder with his economic reforms. And ratings agency S&P downgraded France in November, concerned that the government will be unable to restore the economy's competitiveness. The president took a different tone Tuesday, emphasizing the need to reduce the burden of payroll contributions, taxes and regulation to restore growth. "We will not be able to reduce unemployment unless there is job creation by companies," he said. Public spending would be cut by about 50 billion euros in 2015 to 2017. On an annual basis, such a cut represents a slight increase over the 15 billion euro cut already targeted for 2014. This will allow the government to phase out some welfare charges on businesses and self-employed workers, reducing their tax burden by 30 billion to 35 billion euros. "More and more, the future French economic policy will look like that of the previous conservative majority," said Dominique Barbet of BNP Paribas.